American singer/songwriter Kyle Jennings arrived on the music scene in 2004 when his debut album “Shine” was released on his own label, Dark Horse Records Nashville. The album, produced by decorated session legend and steel guitar man Bruce Bouton, boasted a Neo-traditional country foundation with a gritty mix of guitar-driven Americana, rock, folk, and blues influences. Jennings quickly established himself as a relevant country singer/songwriter and energetic live performer. Raised in the rich mid-western culture of Michigan’s hard-wooded backcountry trails in a blue-collar family Jennings was the youngest of 3 kids. His father Gary worked as a teacher and a homebuilder, and his mother Linda worked as a stay at home mom and part-time nurse. From his early teens Jennings spent summers slinging lumber for his dad learning the trade of home construction and remodeling, and spent the better part of his youth pursuing his first passion of ice hockey. After graduating high school Jennings left his hometown of Kalamazoo to play Junior hockey in Toledo, OH. From there he spent two seasons in Springfield, Illinois playing for the Springfield Junior Blues of the NAHL. After three seasons traveling the US and Canada a string of concussions led to an early exit of his hockey career and ultimately his return home to Michigan. Soon after returning home Jennings would segue his passion for hockey into music. Jennings started playing various clubs in his hometown and writing his own songs and in a short period of time Jennings was entertaining large crowds around southwest Michigan. Jennings began making trips to Nashville and in the summer of 2002 relocated to Music City. Once seated in Nashville Jennings began writing and performing frequently at the local honky tonks and worked as a bartender at the Wildhorse Saloon part-time to make ends meet. In the spring of 2003 Jennings was introduced to steel guitar whiz and producer Bruce Bouton and the two began work on Jennings first record, “Shine”. Following the release of “Shine” Jennings took to the road with a focus of developing as a live performer. He would spend the next few years traveling across the country sharing stages with a multitude of national acts from Hank Jr. to Styx, earning a reputation as a rambunctious high-energy live performer. In 2005 Jennings songwriting was recognized worldwide when his solo-penned “Can I Run in the Dark (and Still Walk in the Light)” was selected as a finalist in the Country category of the International Songwriting Competition, a massive competition that commonly receives 15,000+ entries each year. In the summer of 2005 he was invited to perform as the opening act for WBCT B-93’s “Birthday Bash.” A 2-day, multi-act, 80,000+ country fan extravaganza that included major acts Big & Rich, Phil Vassar, Sugarland, Josh Gracin, and Gretchen Wilson. That performance led to a string of supporting engagements for other country acts like Blake Shelton, Toby Keith, and Hank Williams Jr. In the spring of 2006 Jennings began work on his ambition of establishing an annual music festival in his hometown. With 3rd party financial support he organized his vision and headlined the first ever Dark Horse Music Festival in downtown Kalamazoo at the Arcadia Creek Festival site, a large outdoor amphitheatre and entertainment facility. The event featured various local vendors selling food and drinks to the patrons and showcased a number of Jennings’ friends and fellow independent artists. Then unsigned Jerrod Niemann (Jennings’ roommate at the time), Guitarist Wayd Battle (Jamey Johnson), Raisin’ Cain, Laurie Killian Starr and a number of local country acts filled out the day-long musical roster. While the event attracted in excess of some 2,000 people in the end it suffered significant financial loss. In the face of that loss Jennings’ financiers for the event left him in default of multiple financial obligations and subsequent legal trouble. Garnishments and levies followed him from gig to gig and would eventually prevent him from playing his hometown. Broke, frustrated, and disheartened; in the fall of 2006 Jennings took a position as a front man at Wild Bill’s Atlanta one of the largest indoor live music venue in the US. For the next 6 months he entertained large crowds, opening for scores of national acts spanning multiple musical genres from legendary classic rock acts like REO Speedwagon and Styx to country powerhouses like Blake Shelton and Dierks Bentley. While he enjoyed performing nightly on a big stage it wasn’t long before his passion for creating and recording his own music pulled him back to Nashville. In July of 2007 Jennings returned to Nashville and began working on a new record. While renting a room from friend and musical collaborator Kevin Post the two spent 6 months creating Jennings second record “Long Black Cadillac”. Writing or co-writing all but 2 tracks on the 16-song project, Jennings also served as co-producer on the record with Post; who at the time was making a living as a guitarist for national Country Artist Terri Clark. In 2008 Jennings released “Long Black Cadillac”. Much like the first release, his second album included an array of tones from rootsy country-folk ballads to the guitar-based rock anthem title track as well as an original version of Zac Brown’s “Whatever It Is” prior to the bands national launch later that year. Working stages together Jennings and Post realized a unique live chemistry and recognizable vocal blend. They took on a slew of acoustic shows with Jennings carrying the bulk of the lead vocals and rhythm guitar and Post supplying his deep blues influenced guitar licks and soulful background vocals. Jennings and Post continued to write songs and record together between their travels. By 2009, 7 years into his relocation to Nashville, Jennings started to question himself as a writer and artist, and started to have doubts about his chances at a recording contract. He craved an escape from the rigors and constant stream of disappointments of the music business and returned to the ice, this time as a coach. He began helping in the development of talented young aspiring travel hockey players in the Nashville Jr. Predators travel hockey organization. An accomplished Level 4 USA Hockey certified coach, Jennings would lead teams for the next 7 seasons to a smorgasbord of success including multiple tournament wins, two state championships, 2-USA Hockey National Tournament berths, and winning the 2012 USA Hockey U12 Div 1A Peewee National Championship. All the while, continuing to write and record and tour on the side. Subsequently, after a steady string of musical disappointments and in the heart of tough economic hardships Jennings was ready to pack it in. He suggested during a late night conversation with his father at the family’s Michigan lake house that it was time for him to return home permanently and secure a job and move on with his life. His father insisted he stay the course and reassured him not to lose focus with his musical aspirations. It was a pivotal experience that shaped his motivation and re-invigorated his determination. Jennings returned to Nashville and once again re-immersed himself in music full-time. Dissecting work from his biggest songwriting and artistic influences like Billy Joel, Bruce Springsteen, Paul Overstreet, Johnny Cash, Alan Jackson, Mac McAnally, George Jones, Garth Brooks, and Merle Haggard and incorporating traits into his own work; Jennings toiled to break down and rebuild his craft utilizing his love for musical dynamics and his fondness for storytelling. 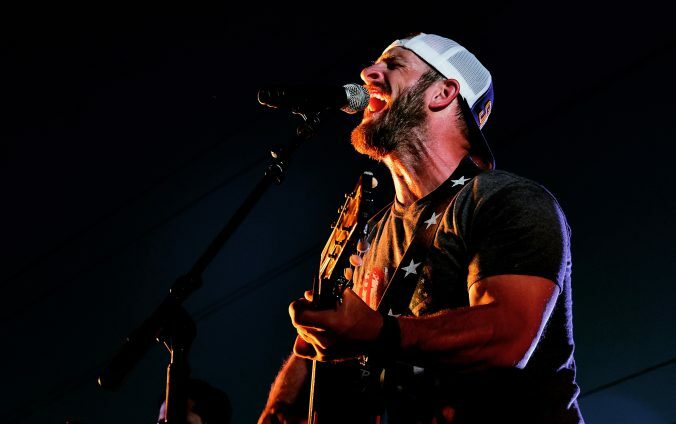 In 2015 Jennings released the single “Freedom Strong”, a powerful patriotic song celebrating the unwavering fortitude of the American patriot and paying homage to past, present, and future heroes of the U.S. military. “Freedom Strong”, a project crowdfunded through a GoFundMe campaign, was release on Memorial Day 2015. 100% of the proceeds of “Freedom Strong” are donated to veterans benefit organizations. The song resonated throughout the military community and in the summer of 2016, he was invited to perform the song at the Pentagon as part of the retirement ceremony for a distinguished U.S. Air Force General. Jennings regards the experience as one of most memorable moments of his career. In August of 2016 Jennings released “American Vinyl”, an American musical journey written and produced by Jennings. His first fully self-produced project, “American Vinyl” and its 13 tracks sweeps listeners through small towns and down back roads, to the heart of the spirit of the American way of life. Standout tracks “Jesus, Jack Daniels’ & Me”, “Day Drinkin'”, and “They Don’t Make Love Like That No More” quickly became instant fan favorites and helped cement a loyal grass-roots fan base. Primarily recognized as a country artist, Jennings music is quite diverse. His infusion of blues, folk, rock, and country have provided him a broad spectrum musical platform and his small town stories and affection for the American way of life has become signature in his work. He currently tours the US both acoustically and with his band performing venues ranging from the smaller honky-tonk circuit to massive fairs and festivals and various live music venues coast to coast.